Fourth legendary lord has been unveiled and it's a CA original character. Her name is Cylostra Direfin and she's a ghostly singer with access to undead Bretonnian knights. Meanwhile, I started a Chaos co-op campaign with a friend. ◊ I'm playing Archaon and he's playing Wulfrik. As he's already confederated all of Norsca, I probably won't be able to unlock the other LLs, but I don't mind that so much - currently I can only support one army anyway and I'll probably spend most of my time accompanying his armies when we finally show Kislev what for. Kislev is actually a pretty interesting case because they bounced back completely from what I did to them - because I didn't want to fight Kraka Drak, I sent my army through Northern Kislev, burning down every settlement on the way. Clan Moulder promptly moved in and colonised them, providing a nice future buffer between the human realms and Norsca. While the other player united Norsca, I sent Archaon north to harass the tribes in the northwest, burning everything to the ground. When I looked south, Kislev had reconquered everything and was in the process of taking out one of the two vassal tribes I did manage to grab. Norsca's not at war with them, so they're currently safe. As soon as the last Aghol settlement falls, I'll move back south and then we'll kickstart our first major incursion by burning Kislev to the ground. Does anyone know which settlements can be colonised/conquered by Norsca outside their home region? The player faction apparently can't occupy dwarven settlements, but the AI factions created by me can. Can the Norsca player settle parts of the Empire/Kislev? I'd imagine coastal settlements and capitals, like normal. Ah, so that's how my vassal tribe was able to colonise this one dwarven settlement - it's a port. At some point I need to start building up a second army, though my income is still fairly low. 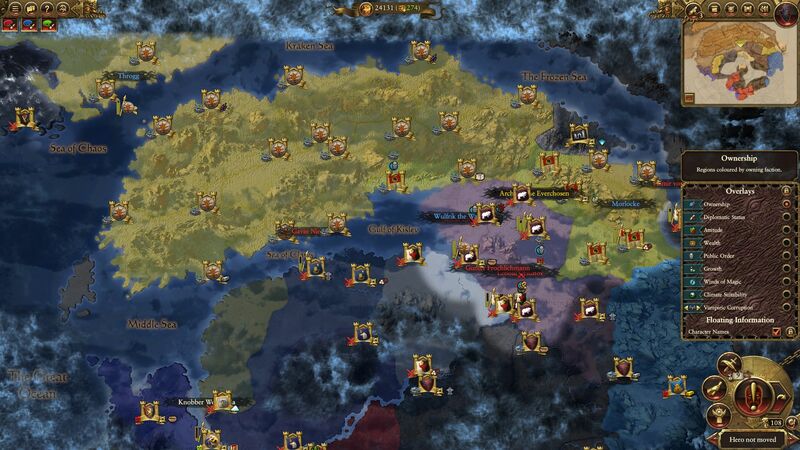 Chaos can't really sustain more than a couple mid-tier armies and stay in the black. Eventually you'll have to just rely on raiding and sacking income to stay solvent. Yep. You really just have to have one army of high-tier units, and one army that’s more filled with low-tier stuff like marauders. 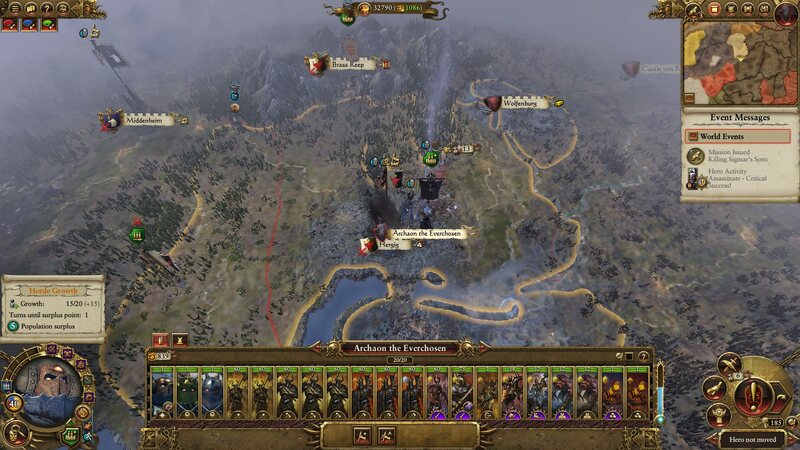 That was a the idea - I'm currently beefing up Archaon's army and as soon as my friend in Norsca's ready, we're gonna descend on Kislev the the other southern realms. I didn't unlock the other LLs, sadly - their unlock requirement is awakening four tribes and Norsca confederated pretty quickly - so I might just hire a generic leader for the second army and name them after a Vermintide 2 boss just for giggles (Benedict Cumberbatch for a sorceror, for example). Apropos Chaos character names - when I tested Chaos in singleplayer, I found this guy in my recruitment pool ◊. I know Chaos leaders generally have metal names, but this one takes the cake. I think I've seen that one before. It works pretty well, of course. Welp, Vampire Coast roster's up. A variety of zombies but no skeletons, and lots of sea monsters and whatnot. Finally made some actual progress in my Chaos co-op campaign. The Norsca player got caught up in a war up north after Hellebron declared war on him for the provinces formerly belonging to the Aghol tribe. They took did take the parts of Deadwood he controlled - killing the army he had up there in the process - but when Hellebron tried to push into the capitál of the Aghol Wasteland, Her whole army got wiped out in the auto-resolve, with the garrison getting a Pyrrhic Victory. A few turns later they asked for peace and some money which he accepted. 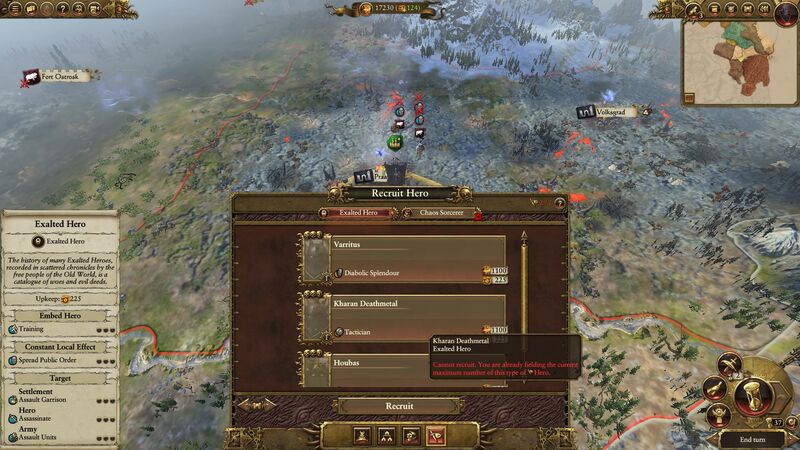 He could never have held all of Deadwood anyway - Norsca can only hold Norsca-style or coastal settlements and the province's settlment are Dark Elf-style - and now he was finally able to commit to my war. I've been sticking to one army so far, replacing my infantry with Chosen over time and getting some cannos. Only Marauder units I kept around were Horsemasters because I needed some ranged units. 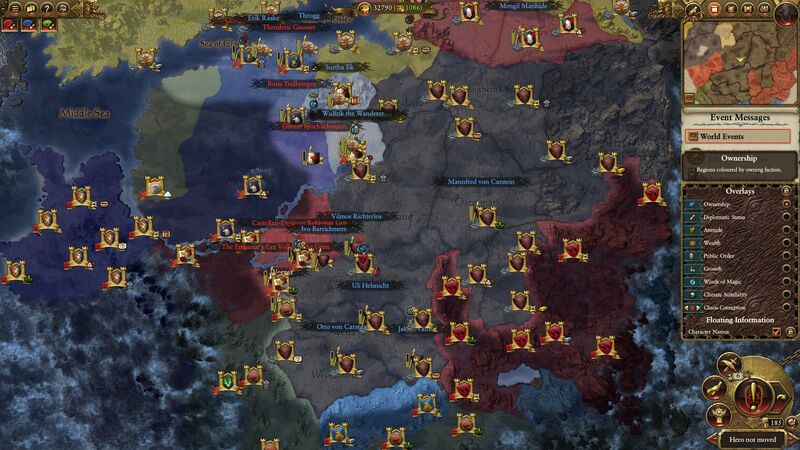 This is the current status of our war with Kislev ◊. I unlocked lightning strike attacks for Archaon, so my strategy so far has been to siege a city to lure some armies in, retreat and then take them out individually before trapping whoever's left within the settlement. I already took out the Eastern Oblast - with Clan Moulder moving in to colonise the area - and am now in the process of sieging down another province capital. The Norsca player went straight for Erengrad because of its port, but it will take a while for their supplies to run out. I also bribed the Vampire Counts into joining my war with Kislev because the Skaven decided to bow out at some point. Meanwhile Ostland finally took out my remaining vassal over in the northeast. They've been sending expeditional armies north for a while, but previously they either had to retreat due to attrition or got wiped out by my army. Both my army and the tribe's own forces were somewhere else, so I guess they saw an opportunity, though after Kislev is dead we're going to kick them straight of the area again - provided a Chaos rebellion isn't going to first. We're also waiting for Throgg to get back south now - the Scourge of Aquitaine spawned in the Aghol Wasteland, so the other played had to send Throgg up to deal with them, but having a third army in Kislev will make things much easier for us. Did someone say SQUID HELMET!? The Vampire Counts rework looks so good, I'm torn between starting a new campaign as them or Vampirates when the update hits. So that's four lords each for the High and Dark Elves. Now the Skaven need one more, and the Lizardmen need two. But yeah, nice to see that Kemmler is getting the Vampire's weakness removed as well. Fitting too since he's not a vampire. He's also getting his own starting position, so a Vampire Counts co-op campaign is finally a valid option - and no VC/Von Carstein combo doesn't count, as it's kinda suboptimal (Mannfred squatting on my sweet, sweet special building). Soooo, the Empire in my co-op campaign is probably screwed at this point ◊. Not only have they been stuck in a war of attrition against the Vampire Counts, they also had to deal with an incursion by the Crooked Moons who took some cities and then got confederated by the Greenskins - who lost most of Wissenland except Nuln. Kislev was at first divided between Clan Moulder - who kept colonising the settlements my friend and I burned down - and the Vampire Counts. After our alliance with Clan Moulder ended we turned north and started burning down their settlements. This resulted in a new power rising in Clan Moulder's place - Mengil's Manflayers, a Dark Elf rogue army - spawned up in Norsca at some point. 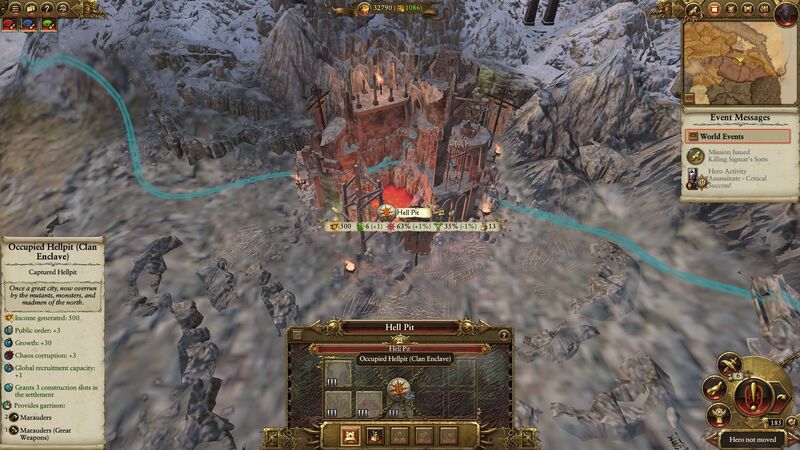 We bribed them to go after the Skaven and they became one of our allies later on. Meanwhile Hell Pit became a new recruitment center for trolls and giants after our combined forces took it in a siege battle ◊. This is probably one of the few non-Norsa inland settlements Norsca is allowed to take over. After dealing with the Skaven we turned west, invading Ostland. We're currently besieging Hergig and Brass Keep has a raiding Norsca army right at its doorstep. Another two armies are raiding Nordland. After we're done with Ostland, we'll either go after Middenheim or Nordland next; whichever one the Norsca player prefers. I also still haven't built another army, but I finally unlocked Kholek. So I might actually consider going for another one at this point. That's my current army composition ◊. I'm thinking of replacing the regular Chaos Spawn unit with a giant as soon as I unlock the building and maybe replace the chariot with some cavalry. 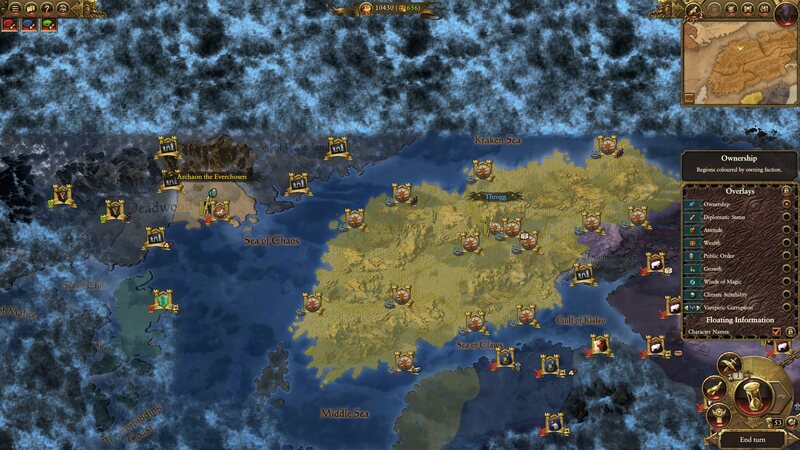 I imagine it's just as bad if not worse in Mortal Empires but in many of my Warhammer 1 walkthroughs it seems that the Empire gets wrecked a dispropriate amount of time, and this was post-Foundation update (or whatever it was called) that gave them an entire province. Also, I have to say that Hell Pit being used as a major Norsca base is really cool. Eat your heart out rat-things! Norsca still has the same "Norsca-type cultural settlements and coastal outposts only" mechanic it had in the first game, but apparently there are some exceptions. Though I wish conquering Hell Pit as Norse would you give access to a few Skaven units to create some kind of hybrid army. Another fun thing I found out - rogue armies only have a special town building - they can't actually build any other buildings in their settlements (except maybe a resource building in some cases). Can't they also capture capitals? That would explain why Hell Pit can be annexed. Damn, that would be cool. Mortal Empires as Chaos makes me wish that there was an option for us to put back the "Races can only colonize settlements in certain areas" option. Playing Whack-a-mole with Empire factions who decide to come north and colonize any city regardless of utility is super annoying.